We present a case of primi para who on day 3 of full term normal vaginal delivery, developed acute onset pain and swelling of left forearm associated with tenderness and erythema that ascended to the upper arm. 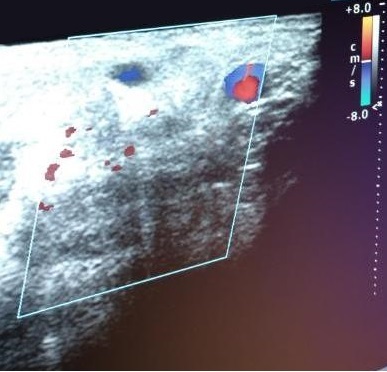 Arterial and venous Doppler sonography showed a chronic thrombus of left cephalic vein. A diagnosis of acute superficial thrombophlebitis with underlying chronic thrombus of cephalic vein was established. Patient was started on anticoagulation and given glycerine magnesium sulfate dressing following which the symptoms subsided. Superficial venous thrombosis (SVT) is receiving increased attention as more clinicians are recognizing the potential morbidity of untreated disease. The prevalence of associated acute deep vein thrombosis (DVT) in patients presenting with SVT is estimated to be 6.8 – 40%[1,2,3] with symptomatic pulmonary embolism occurring in 2 – 13 % of patients. Asymptomatic pulmonary embolism occurs in up to one third of patients with SVT based on lung scans. This makes prompt recognition and treatment imperative. A review of current strategies involving newer and developing treatment approaches is warranted. A 22 year old primigravid patient with no history of any previous medical or surgical illness, presented to the emergency services in early labor. The patient progressed spontaneously and delivered a female child of 3.4 kg. On day 2 postpartum, the patient had a single fever spike of 38.4 degree Celsius. Fever profile including leptospirosis, malaria, dengue were negative. Fever subsided with a single dose of paracetamol. There was no fever thereafter. On day 3 postpartum, the patient developed a painful swelling over the left forearm associated with tenderness, erythema and warmth. Over the next 12 hours, the swelling progressed to involve the left arm. On general examination, vital parameters were normal. Patient’s abdomen was soft, no guarding, tenderness or rigidity were seen, and uterus was well contracted. Episiotomy was healthy. A surgical reference was taken and as per their advice an arterial and venous Doppler sonography was done which showed a chronic thrombus in left cephalic vein. Figure 1. Color Doppler sonography showing chronic thrombus in left cephalic vein. Figure 2. 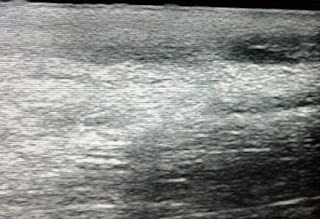 Sonography showing chronic thrombus in left cephalic vein. A diagnosis of superficial thrombophlebitis with underlying chronic thrombus of left cephalic vein was established. DEXA scan was suggestive of osteoporotic features. As per discussion with hematologist, treatment with low molecular weight heparin 0.6 ml subcutaneously twice daily and warfarin 5 mg once daily was initiated. Prothrombin time was monitored and INR was maintained between 2 - 3. Glycerine magnesium sulfate dressing was done twice daily along with local application of heparin sodium (thrombophob) gel. Following this her symptoms subsided. Currently the patient is on anticoagulants, to be continued for 6 weeks. The prevalence of associated acute DVT in patients presenting with SVT is estimated to be 6.8 – 40 %. [1,2,3] Patients typically present with pain, warmth and sometimes a palpable mass overlying a superficial vein. There may be signs of chronic venous disease, with visible varicosities, skin pigmentation, or palpable cords. SVT is characterized by thrombosis and inflammation in a superficial vein. It involves the great saphenous vein in up to 60 – 80 % of cases, small saphenous vein in 10 – 20 % of cases, followed by upper extremity veins. Thrombosis normally occurs as a sequel of phlebitis or inflammation and not infection of the vein. However, secondary phlebitis is also seen. The pathophysiology of SVT can be classified as external trauma, internal direct endothelial trauma, inflammation of vein wall and primary hematologic changes. External trauma can occur from direct external force or compression causing sustained endothelial damage, edema and leukocyte activation. Internal trauma involves a direct endothelial injury leading to the same inflammatory response, with similar outcomes. The inciting event is often phlebotomy and intravenous infusions. The duration of cannulation is related to the rate of SVT. Hypertonic solutions can directly injure the endothelium. Infusions in more distal veins are also more likely to cause SVT. Intravenous catheters can also serve as the nidus for infection. Thrombus at catheter tip becomes secondarily infected. Hypercoagulability may be associated with SVT in as many as 35 % of patients. [7,8] Hypercoagulable disorders associated with SVT are factor V Leiden mutation (the most common), mutation in 20210 A gene, plasminogen abnormalities, tissue plasminogen activator disorders, lupus anticoagulant, and anticardiolipin antibody syndrome. Thrombocytopenia, polycythemia and sickle cell disease also are implicated as risk factors for SVT. There is limited information on the relation of pregnancy and SVT. In one retrospective study involving 30,040 pregnancies, 14 cases (0.05 %) were diagnosed by ultrasonography, mostly presenting within 48 hours of delivery. McColl  found an incidence of 0.068 %. Ten cases occurred prior to delivery and the remaining occurred within 7 days postpartum. Of the patients with SVT 24 were tested for thrombophilic abnormalities and one was positive for Factor V Leiden mutation. Patients with SVT should be subjected to a thrombophilia workup using the criteria that are used for acute DVT. In addition, screening should be done for underlying diseases, such as malignancy or vasculitis, with mammography, colonoscopy, as appropriate. A duplex ultrasound scan must be done in patients suspected of having SVT. A duplex ultrasound scan may not be required in patients who have peripheral SVT associated with catheter or direct trauma related minor SVT. The treatment depends on the site, the presence of acute DVT, presence of varicose veins, hypercoagulable disorders, and whether it is the first episode or a recurrence. The aim is decreasing pain, inflammation, and complication prevention. The offending foreign body must be removed. The most common indication for anticoagulation is the presence of associated acute DVT/ pulmonary embolism or increased risk of the same, due to the location of SVT. The most recent American College of Chest Physicians guidelines recommend low molecular weight heparin or unfractionated heparin for at least 4 weeks. Patients with SVT but without clinical risk factors are at lower risk to develop complications of venous thromboembolism and less aggressive stance may be justified. It is necessary to adopt a more individualized and personalized approach to the management of a patient with SVT. Belcaro G, Nicolaides AN, Errichi BM, Cesarone MR, De Sanctis MT et al. Superficial thrombophlebitis of the legs: a randomized, controlled, follow-up study. Angiology. 1999; 50(7): 523–9. 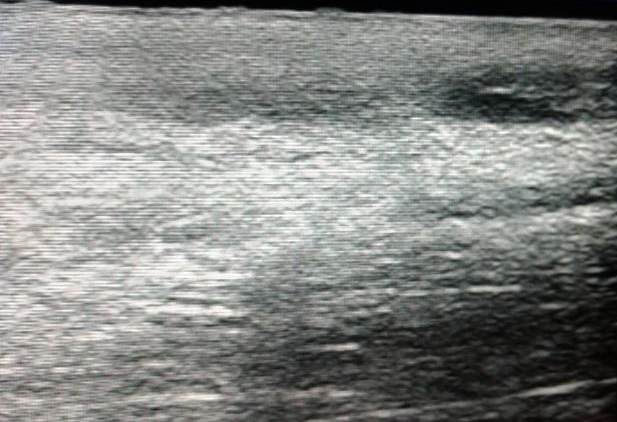 Ascer E, Lorensen E, Pollina RM, Gennaro M. Preliminary results of a nonoperative approach to saphenofemoral junction thrombophlebitis. J Vasc Surg. 1995; 22(5): 616–21. Skillman JJ, Kent KC, Porter DH, Kim D. Simultaneous occurrence of superficial and deep thrombophlebitis in the lower extremity. J Vasc Surg. 1990; 11(6): 818–23. Di Nisio M, Wichers IM, Middeldorp S. Treatment for superficial thrombophlebitis of the leg. Cochrane Database Syst Rev. 2013; 30(4): CD004982. Leon L, Giannoukas AD, Dodd D, Chan P, Labropoulos N. Clinical significance of superficial vein thrombosis. Eur J Vasc Endovasc Surg. 2005; 29(1): 10–17. Meissner MH, Wakefield TW, Ascher E, Caprini JA, Comerota AJ, Eklof B et al. Acute venous disease: venous thrombosis and venous trauma. J Vasc Surg. 2007; 46 Suppl S: 25S–53S. Hanson JN, Ascher E, DePippo P, Lorensen E, Scheinman M, Yorkovich RPA et al. Saphenous vein thrombophlebitis (SVT): A deceptively benign disease. J Vasc Surg. 1998; 27(4): 677–80. McColl MD, Ramsay JE, Tait RC, Walker ID, McCall F, Conkie JA et al. Superficial vein thrombosis: incidence in association with pregnancy and prevalence of thrombophilic defects. Thromb Haemost. 1998; 79(4): 741-2. Kearon C, Kahn SR, Agnelli G, Goldhaber SZ, Raskob GE, Comerota AJ. Antithrombotic therapy for venous thromboembolic disease: American College of Chest Physicians Evidence- based Clinical Practice Guidelines (8th edition). Chest. 2008;133(6 Suppl):454S–455S.